With the third anniversary of her tenure as Peterborough-Kawartha MP fast approaching, Maryam Monsef’s excitement for the difference she feels she can make is as clear as the day she was elected. Speaking over lunch Friday (October 12) at the Speak Easy Café in downtown Peterborough, the 33-year-old Liberal Cabinet member — she was appointed Minister of Status of Women in January 2017 — touched on several topics while making clear her intention to seek re-election next year. 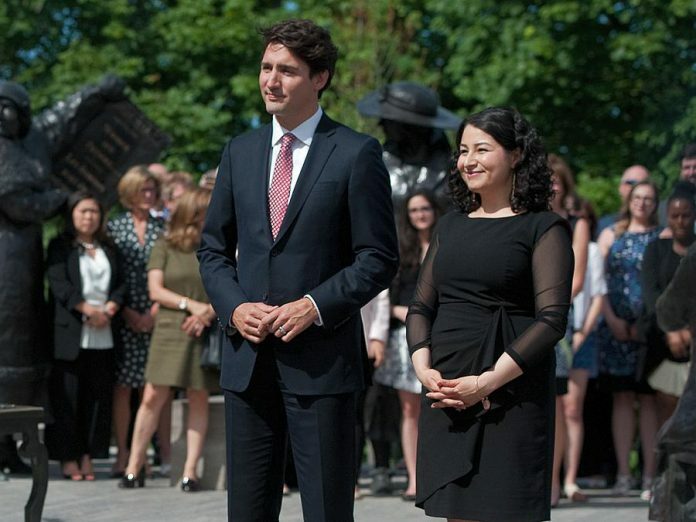 “We’ve accomplished a lot together but we still have a lot more work to do … I’m up for the task,” said Monsef, noting she will allow her name to again stand for nomination as the local federal Liberal candidate. Not surprisingly, much of Monsef’s optimism for what’s ahead, and her clear pride in what has transpired, is rooted in the empowerment of women and young girls across the country. To that end, last Thursday (October 11) she was immersed in International Day of the Girl events here in the riding. First marked in 2012, the United Nations-declared observance supports more opportunity for girls and increases awareness of gender equality on a global scale. 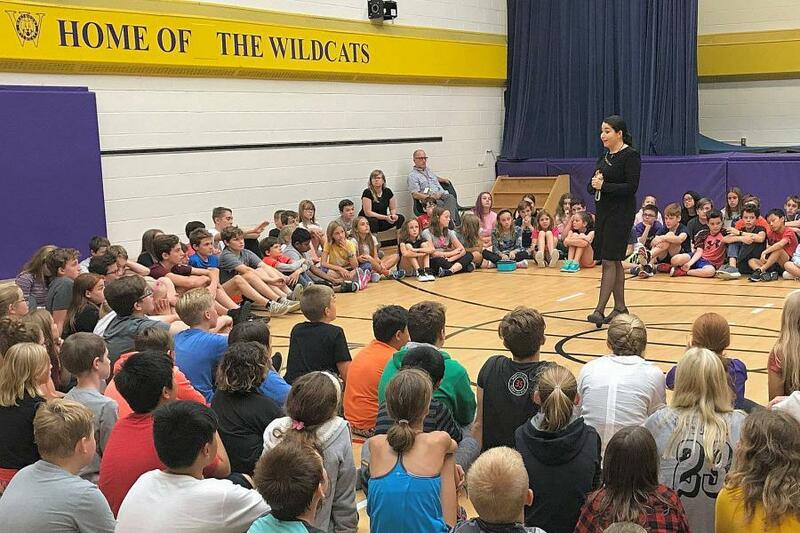 Locally, the day saw Monsef attend both Westmount Public School and Thomas A. Stewart Second School for town hall-style assemblies, as well as host a roundtable at her Bethune Street office with a group of girls ranging in age from 6 to 14 years old. “When we asked them ‘What does it mean to be a girl?’, a lot of their responses were about how important it is for them to be seen, to be heard, to be recognized, for there to be fairness … that girls can do the things that boys can do,” noted Monsef. “We would do well to listen to girls and include boys in the conversation. Our girls are confident, they’re compassionate and they want to get things done. Theirs is the smartest generation to have ever lived; the most powerful generation. I tell them this over and over again. Noting how important is that young girls have mentors, Monsef is taking action in that regard, organizing and hosting the inaugural Peterborough-Kawartha Women’s Leadership Awards on Saturday, October 27th at 7:30 p.m. at Showplace Performance Centre in downtown Peterborough. Awards presented will highlight nominees’ achievements in such areas as entrepreneurship, environmental stewardship and poverty eradication, with one receiving a Lifetime Achievement Award. While nominees won’t be revealed until the event, kawarthaNOW.com founder and publisher Jeannine Taylor is among them. Of particular note, each nominee, as well as audience members, are asked to bring a youth along. Referencing her own experience, Monsef said role models were pivotal in making her aim higher. “Whatever I’ve achieved in my life, whatever opportunities and doors opened for me, whatever challenges I’ve had, they have brought me to this moment in time,” she said. “None of that would have been possible without the support of mentors and champions who genuinely cared about me; who took the time to invest in me and pick me up when I had fallen and encouraged me to pursue big ideas and big dreams and to help me make them happen. I come to this work with an understanding of the responsibility I have to pave the path for others in the same way that it was done for me. 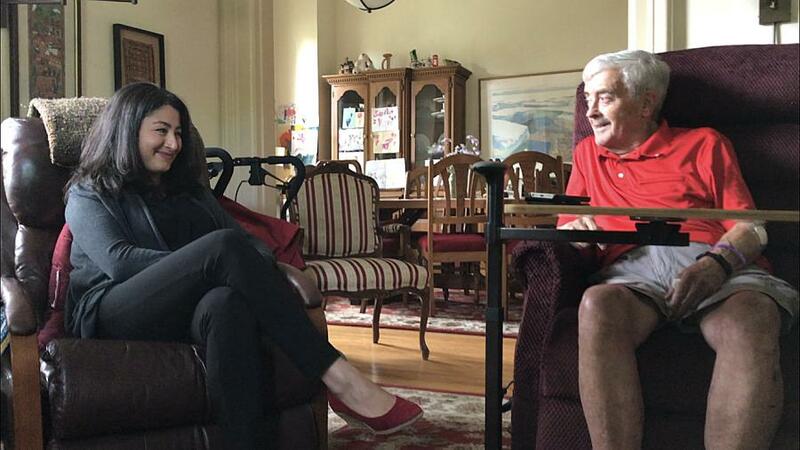 On Saturday (October 13), Monsef was in a packed St. John’s Anglican Church, honouring the memory of one of her most influential mentors: former Peterborough MP Peter Adams, who died on September 28th at age 82 following a battle with cancer. “He was my MP, he was my friend, he was my mentor, and then he was my constituent,” she said, no shortage of awe in her voice. “I first met Peter at Confederation Park. I was in high school at PCVS and was outside with some friends. He was in his hot pink shorts, jogging as so many of us remember him. He stopped and came and talked to us. He took the time to give us young people the time of the day and answer questions. 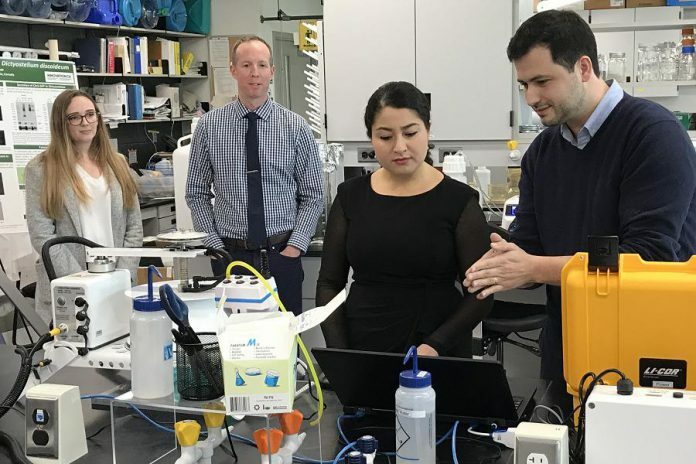 In what proved to be a very busy week for Monsef, she dropped by Trent University last Tuesday (October 9) to announce $2.4 million in funding from the Natural Sciences and Engineering Research Council (NSERC) to support research on topics ranging from Alzheimer’s resistant memories to the ecological impacts of human landscape use. Looking ahead, two developments coming to fruition on the near horizon — the legalization of recreational marijuana this Wednesday (October 17) and the election of a new Peterborough city council on Monday, October 22nd — are catching Monsef’s attention. “This (marijuana legalization) is important for our communities because our kids will be safer, and our communities will be safer, because the money will no longer go to fund organized crime,” said Monsef. As for the municipal election, Monsef is particularly pleased that a number of women are seeking election, including mayoral candidate Dianne Therrien. It was just four years ago that Monsef — a political neophyte — made her own bid for the mayor’s chair, losing by just 1,331 votes to incumbent Daryl Bennett. If Monsef has a preference for who will lead the City of Peterborough politically over the next four years, she isn’t saying but the inference is clear. “Just 18 per cent of mayors in Canada are women,” she pointed out.